At Syracuse University, a mixed group of both graduate and undergraduate students had the opportunity to participate in a project involving an innovative new wing design. Overseen by Prof. Thong Dang, the team sought to analyze this new design to determine its practicality and effectiveness. The initial analysis called for extensive computational fluid dynamic (CFD) analysis, requiring grid construction in Pointwise, followed by simulation in ANSYS Fluent. The design, however, was not like any other wing, in that it had variable leading edge geometry and also sought to seek aerodynamic benefits from a leading edge embedded fan. In the preliminary cases run last summer, all analyses were two-dimensional. To start the gridding process, an initial geometry of the chosen airfoil was imported into Pointwise. Whereas most airfoils can be gridded relatively easily using a standard C-Mesh technique, this geometry required a more involved process because of its complex leading edge geometry. The space around the airfoil was separated into regions to allow for a more detailed meshing technique to be used in this area. By dividing this space, the easier areas could be gridded faster, while the more complex sections could receive more attention. The initial spacing and quality of the grid off of the solid surfaces of the wing needed to be controlled because resolving the airfoil's boundary layer is crucial for accurate results. Also, since calculations needed to be done using different turbulence models in Fluent, several grids needed to be constructed with different initial spacing values. However, using Pointwise's normal extruding function for both the leading edge body and the larger airfoil body allowed for easy control of this grid spacing. After this performed extrusion, the outer sections surrounding the airfoil geometry could easily be meshed with a structured mesh, paying attention to growth rate and cell shape. Meshing inside the housing proved to be more difficult for several reasons. First, the fan inside the housing included many small fan blades that involved intricate gridding. The gridding around the fan blades could not interfere with the gridding on the inside housing walls, but also needed to maintain an initial spacing from the blades for accurate results. In addition, the rotation of these blades needed to be simulated (sliding mesh) when the grid was imported into Fluent. The last difficulty arose from the wing's changing geometry. In order to optimize the opening spacing for the housing, several grids needed to be constructed, each with a different angle opening. Pointwise allowed for easy rotation of this leading edge, however the housing had to be remeshed after each change. To tackle these issues, the fan blades themselves were gridded first in a separate file. This involved numerous extrusions from each blade and optimizing of blade point spacing for good quality cells. However, after this step was completed once, it never had to be repeated. Since the geometry of the fan never changed from case to case, this mesh could be used for every setup. The fan mesh could then be appended into a file corresponding to any case. A version of the final housing mesh is shown in Figure 1. Figure 1: Gridded fan housing. Thereafter, the grid easily could be completed around the fan with an unstructured mesh. 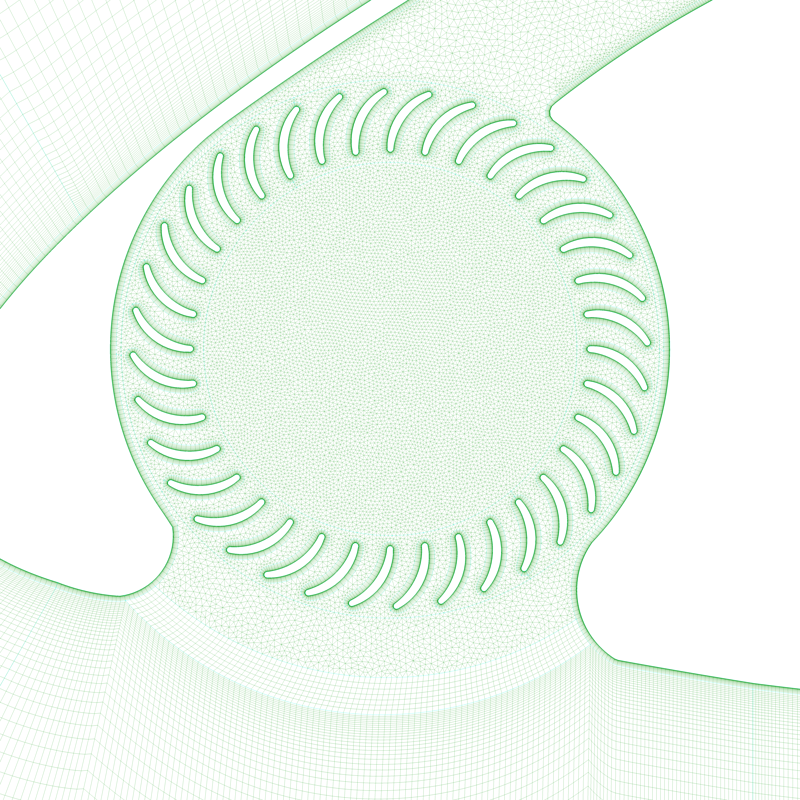 The final step of this mesh creation involved creating interfaces around the outside and inside of the fan so that Fluent could recognize this area as the rotating section. This would allow Fluent to simulate the fans movement, and calculate accurate values for the aerodynamic forces on the whole airfoil structure. 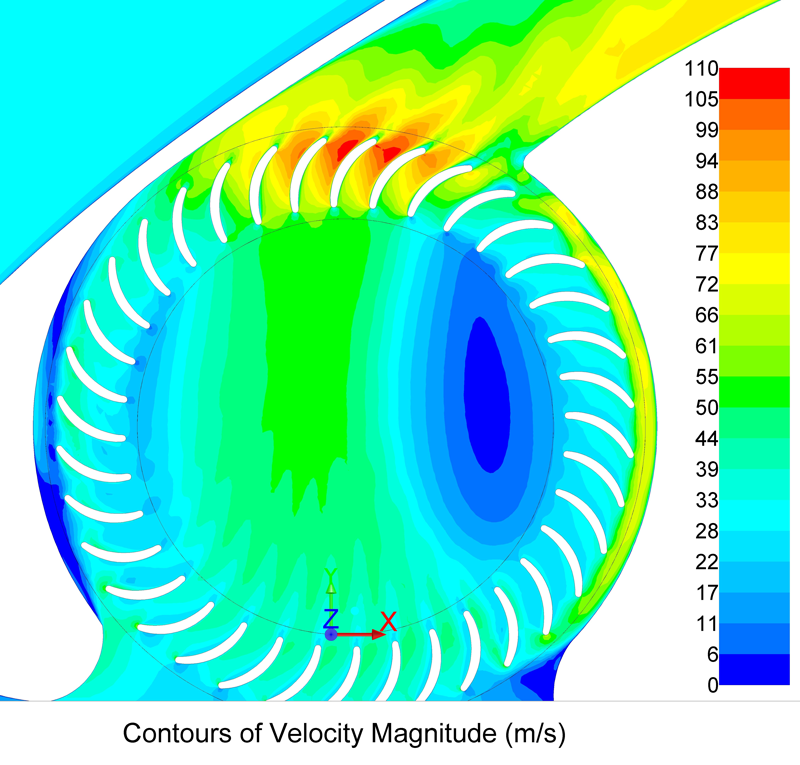 Figure 2: Velocity contours around the fan and housing.